There are many options for controlling product flow on your packaging or processing line. Options such as diverters & gates, lane guiding, and pushers all provide different advantages for customers. When you need to move product off the conveyor in a perpendicular flow, a pusher may be your best option. Pushers can also be useful when your product is particularly heavy. To demonstrate how this application works, we filmed the product pusher moving a tub and weight totaling 195 lbs. In this application, the customer was moving a 180-pound block of food down their food processing line. Once the block reaches the end of this curve conveyor, it can either continue off the discharge end or the pusher can be activated to transfer the block onto a table situated next to the conveyor. 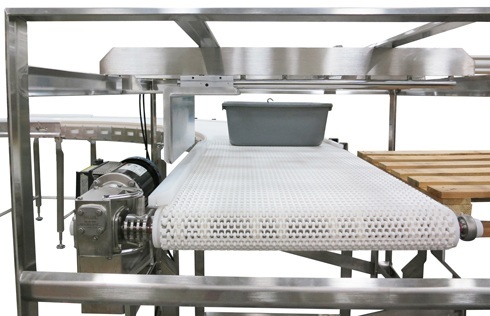 The conveyor in this system is an AquaPruf 7400 Series stainless steel conveyor designed for sanitary applications. This conveyor uses FDA approved belting and plastic components. The frame is designed with no horizontal surfaces for optimum cleaning. The pusher is a standalone assembly allowing the conveyor to be removed as needed. The product pusher had to match the AquaPruf’s sanitary features, so it was designed for a washdown environment. The pusher has a pneumatic cylinder with a 30” stroke which ensures full travel of the product off the conveyor. The cylinder is also washdown rated. The pusher assembly is standalone from the conveyor so that the conveyor can be pulled out from the pusher assembly if required for cleaning or other needs. A manual switch is supplied in a sealed junction box on the discharge end of the conveyor to allow manual activation by an operator if required. The controls on this conveyor were provided by the customer who intended to place a photo-eye on the conveyor to signal the pusher to activate. Dorner did provide a watershed enclosure to protect the components in the washdown environment. Learn more about Dorner’s Engineered Solutions Group and the custom systems they provide.